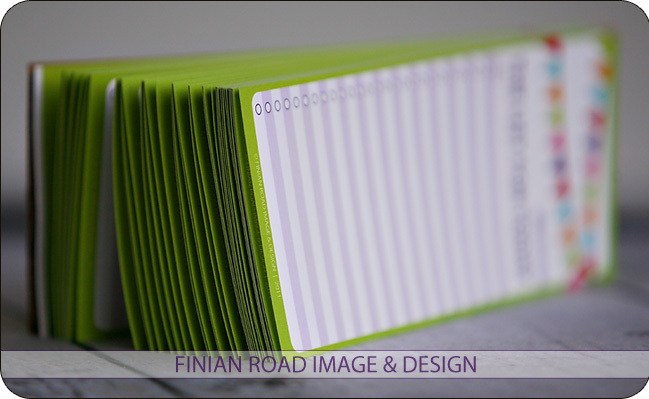 Finian Road Image & Design • The Blog: A Design Giveaway! As the commercial side of Finian Road's design business flourished last year, I started to have an itch to design fun, personal pieces as well. 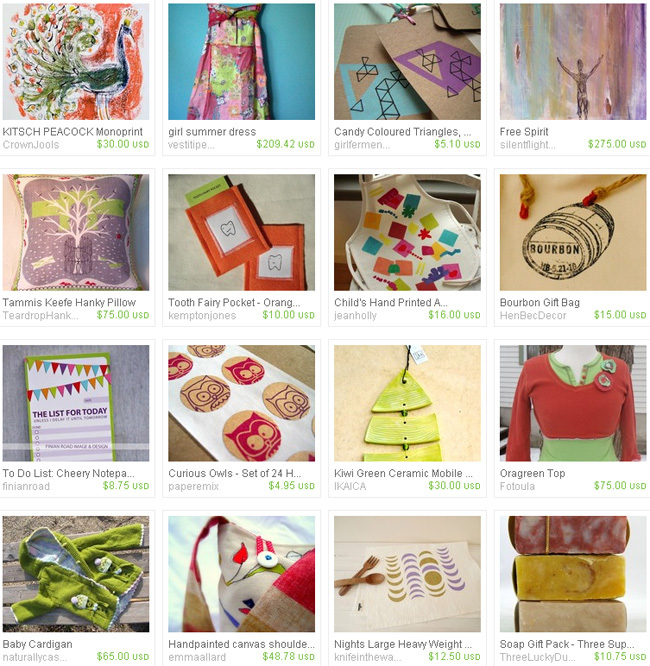 Lots of color, quirky items, more creativity. Stuff that's cute and fun to not only have, but give as well. The notepads each have 50 sheets and are bound at the top. I seriously love checking boxes off. I am a nerd, I know. The day the cheery to-do notepad was listed for the first time, it made a treasury of "undiscovered finds" on Etsy! Artsyville highlighted it with other goodies on Etsy. Speaking of Artsyville, she has absolutely beautiful goodies in her shoppe. What I love to do via design she does by hand...you should check her stuff out as well! Sized roughly the size of a baseball card, they're cute and perfect to tuck in with lunches. You could even use them with care packages to bring a smile to the face of someone you love! And to celebrate the new personal design launch, I'm giving away two goodies! Just leave a comment here by Tuesday evening (February 1st) at 6 pm Pacific. Let me know which one you'd want to win...and I'll announce the winners tomorrow night. Good luck! I love the to-do list! I love the to do lists! 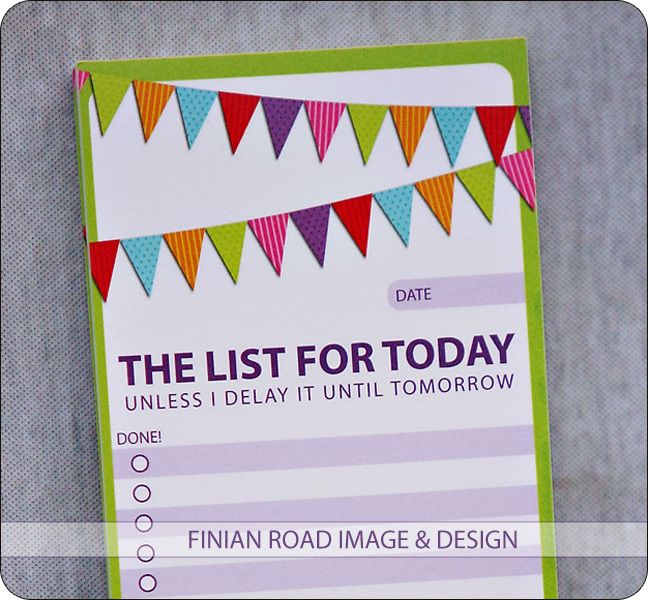 I am a list-making junky... and love, love, love the cheery notepad! You make such awesome stuff! YEAHHHH!!!!!!! So excited for you! Can I feature on my blog for a Shopping Sunday? I love both of your new items and can't wait to see what else you come up with! You are very talented. Shelley, you are hilarious and the creativity that flows from you is God given. Both are so cute and I agree with you, I love to check off boxes as well. You are so creative & organized! I need some organization help. Give Thomas a kiss for me. Oh my goodness, Shelley- You're amazing!! I LOVE the lunchbox notes..those are too funny! Congrats on your new and improved Finian Road! YAY! I have been anticipating the brilliance of Shelley at Etsy!!! I love your design, it makes me happy. I would love a cheery "to do" list! Thanks for "advertising" your giveaway on Facebook. And I hope your Etsy store totally takes off!!! You're so creative. :-) I love the "to-do" lists, of course. Shelley, You have such amazing ideas. Those are both so cute! Shelley: You are so amazing. I love this stuff, and I love that you started an Etsy store. I would choose the to-do lists. I love 'em and would use them all the freakin' time. So cute! I want to win the to do lists! The lunch box notes are pretty cute too. I am sure Zach would appreciate the heads up - before he starts unwrapping the random packages of foil that I found in the fridge, tossed in his lunch box, and hope are edible. Love your stuff Shelley. Some of the very things that keep you sane are the very same things that work for me. labels, list, check marks, etc. Have fun with your items. 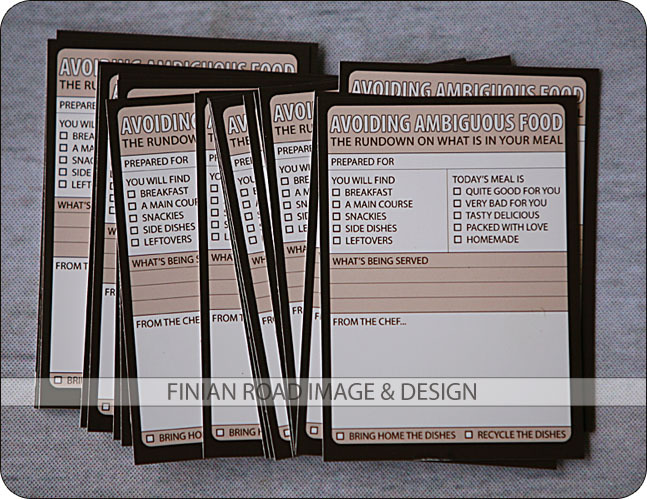 I think those Lunch cards are hilarious!! I just started to bring my lunch for work and pack one for Jesse too!! Those would be a fun addition!! You are SO creative!!! I love all the fun things you do and so does my type A personality. I like the colorful to do list. I have to do lists at home, to do lists at work, to do lists everywhere! With a new baby on the way I think I would LOVE the To Do List! Great idea by the way...I will totally check out your shop! I'm thinking that a certain legal assistant in my life needs a gift from her boss of a to-do list. I never heard of etsy but you know I wish you much (more) success. What can't you do? I love your to-do-list!